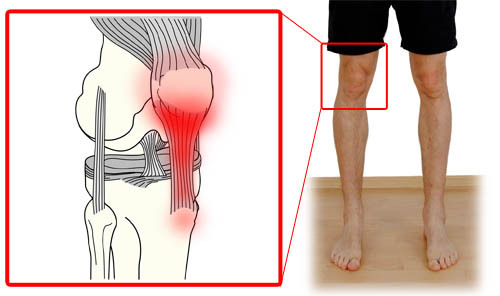 Patellar tendonitis (jumper's knee) is an injured tendon that connects the patella (kneecap), to your shin bone. The patellar tendon works in tandem with the front muscles of your thighs when you extend your knees, so you can run, kick, and jump. However, even those who do not participate in sports activities can get patellar tendonitis from the chronic stress on the patella tendon, and a patellar tendonitis recovery time can last from a couple of weeks, to several months, depending on the severity of the injury. How Long does It Take to Recover from Patellar Tendonitis? The recovery time of patellar tendinitis is often specific to the degree of involvement. A patella tendon that is only mildly injured and has just recently started to hurt can improve within a couple of weeks. A patella tendon competely torn requires surgery repair and 3 to 6 months for full recovery. However, for most people taking it easy for 6 weeks or so usually suffices. 1st Degree is best described as pain only after an activity, with no undue practical impairment, and it is often treated with cryotherapy. The person should use ice massage or ice packs after finishing the activity that aggravates the pain, and again later in the evening. If the pain persists, regularly prescribed anti-inflammatory medications could be administered for 10 to 14 days by your health care provider. 2nd Degree is best described as pain both during and after activity, but the knee is still able to function satisfactorily. The pain may interfere with sleep, and the activities that caused overstressing of the patella tendon should be avoided for 2 to 4 weeks. For pain relief, cryotherapy should continue, or if the pain is intense, a local corticosteroid injection may be considered from your health care provider. 3rd Degree is best described as sustained pain, and performance and sport participation are adversely affected. Though the pain increases, therapeutic cryotherapy measures should be continued along with not participating in activities that can worsen, or prevent recovery from the injury. If the condition does not improve with treatment, surgery may be considered by you and your health care provider. Everyone's patellar tendonitis recovery time varies from person to person. Returning to activities depends on how soon the knee recovers, not by how many days or weeks it has been since the injury has occurred. Generally speaking, the longer you have symptoms before you start treatment, the longer it can take to get better. The goal is returning to normal activities as soon as is safely possible. If you return too soon, you may make the injury worse. Though the recovery time differs, and sometimes it can be long. But no worries, there're many options to shorten that time. Patellar tendonitis doesn't usually require a doctor's care, and following these recommendations can help to relieve the knee pain and cut back on patellar tendonitis recovery time. Refrain from activities that caused the tendonitis. The more you work the tendon, the worse the injury will become, and the recovery will takelonger. Apply ice wrapped in a towel for 15 minutes once or twice a day. Ice helps reduce swelling, which will lessen knee pain and speed healing of the tendon. Lie down and elevate your knee on a pillow so that it's higher than your heart. This will help reduce swelling and aid blood flow. Take over-the-counter anti-inflammatory, nonsteroidal medications, such as naproxen or ibuprofen. They not only relieve pain, but also reduce swelling. Stretch and warm up before beginning exercise. Then take it slow for a few weeks. After your tendinitis disappears, don't go back immediately to the same level of activity that caused the injury. Stretching: Steady and regular stretching exercises reduce muscle spasms and help to strengthen the patella tendon. Don't jump during your stretch. Strengthening: Thigh muscles that are weak may contribute to the strain, and strengthening exercises, such as lowering of your leg slowly after extending it, can be particularly beneficial. Patellar tendon strap: A knee-strap that distributes forces away from the patella tendon and directs it through the knee-strap instead. Iontophoresis: A therapeutic device that involves delivering a low electrical charge that causes a corticosteroid medicine to push through your skin. Avoid playing through the pain: Whenever you have noticed any knee pain, ice the area as soon as possible and rest the injured knee. Then wait until your knee is pain-free, and avoid other activities that may put stress on your patella tendon. Strengthen muscles: Stronger thigh muscles are key to better handle the stress that causes patellar tendinitis. Eccentric exercises of the thigh muscles are very beneficial to prevent future patellar tendonitis. Instructions and lessons: In order for you to be sure you're using your body correctly, consider getting professional instructions or taking lessons when using exercise equipment or starting a new sport. How Can You Break Wrist on Purpose? Can You Run on a Sprained Ankle?